A field of five sophomores, headed by a pair of ‘TDN Rising Stars’ from the stacked Bob Baffert barn, figure to vie for favoritism in Sunday’s GII San Vicente S. going seven furlongs at Santa Anita. Little went right for the highly regarded Coliseum (Tapit) in the GIII Sham S. Jan. 5 following a jaw-dropping 6 3/4-length tally on debut at Del Mar Nov. 17. The gray, favored at 3-5 in the Sham, reported home a very disappointing sixth that day after a slow start and wide trip. 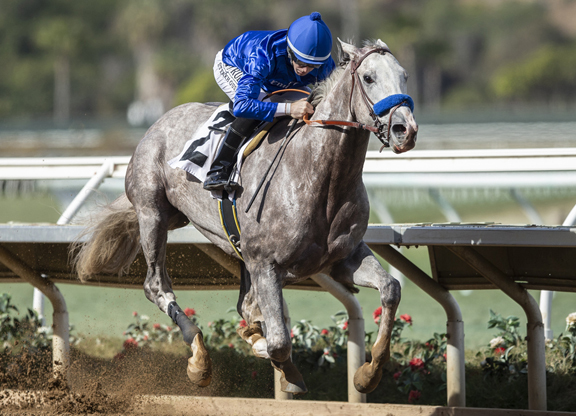 The Godolphin homebred fired a six-furlong bullet from the gate beneath Mike Smith in 1:12 1/5 (1/11) Jan. 30. He cuts back to one turn for the San Vicente. Fellow ‘Rising Star’ Dessman (Union Rags) romped by 7 1/2 lengths as the 4-5 chalk going six furlongs first out at Santa Anita Jan. 19. 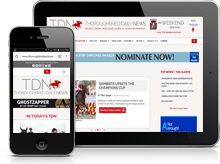 The bay brought $750,000 from bloodstock agent Donato Lanni on behalf of Sheikh Mohammed bin Khalifa al Maktoum after breezing a quarter in :21 1/5 at the Fasig-Tipton Gulfstream Sale.